Is there a better alternative to WidsMob ImageConvert? Is WidsMob ImageConvert really the best app in Photography category? 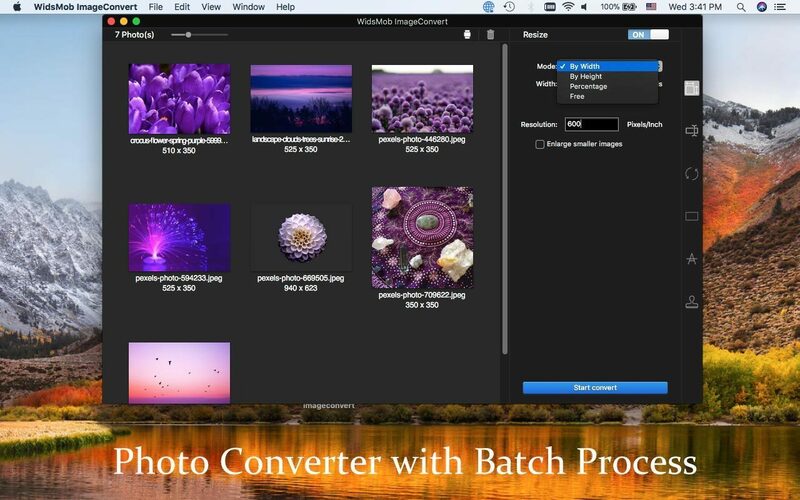 Will WidsMob ImageConvert work good on macOS 10.13.4? WidsMob ImageConvert needs a rating. Be the first to rate this app and get the discussion started! 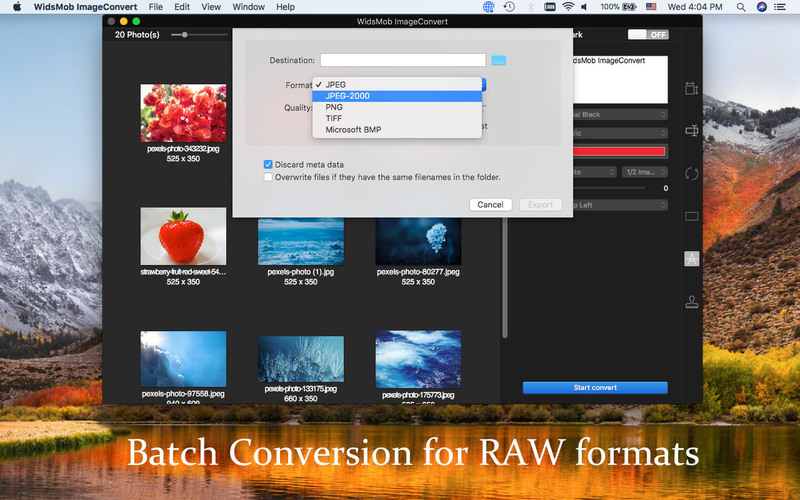 WidsMob ImageConvert allows you to convert RAW in batch. Whether the RAW format with DSLR cameras, or mixed-format images, you can turn photos into to JPEG, JPEG 2000, PNG, TIFF, BMP, and more. What is more, the advanced algorithm has 6x speed to convert RAW formats into JPEG and other photo formats. 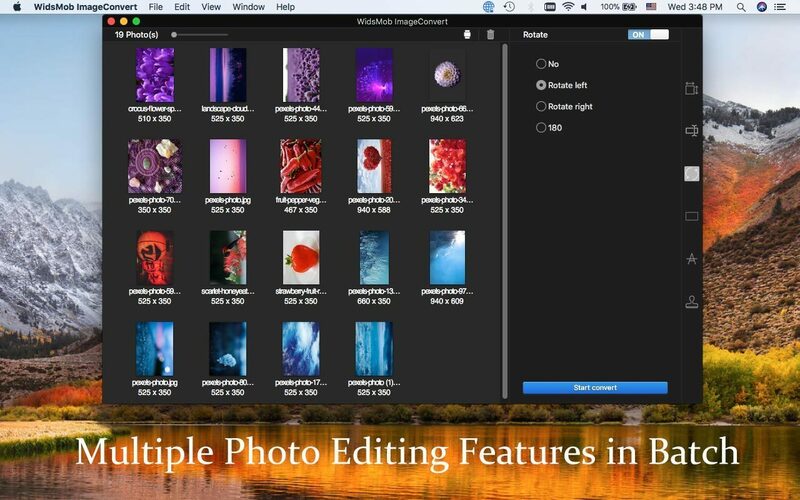 Photo editing features. Resize photos in 4 different modes, By Width, By Height, Percentage and Free, which even enable you to enlarge small images. You can also rotate videos with different angles in batch, add border or frames in different color modes. Add watermark. 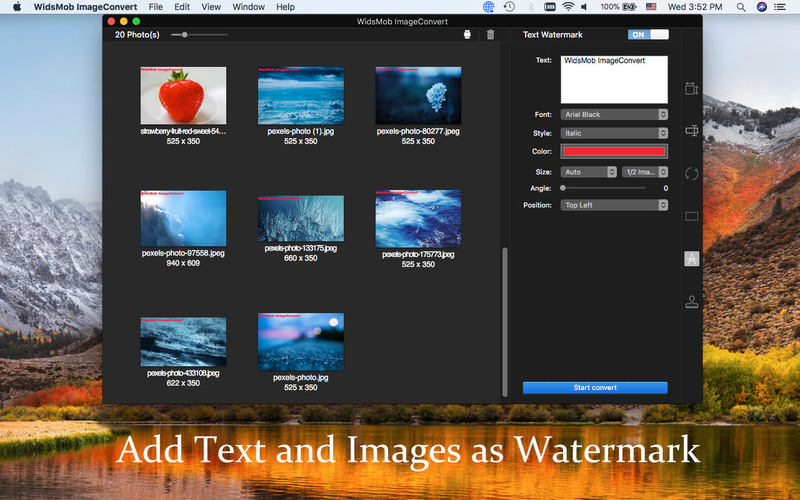 Not only add captions and images as a watermark but also allows you to adjust font, style, color, opacity, size, angle, position and more in batch. You can instantly preview the applied effects on all the photos to get the optimal result. Instant preview. When you apply the photo effects or add watermark, you can have install preview for the result from the interface for all the image files. And you can also click Preview to check the result for each image in detail in an easy process. User-friendly. Settings to overwrite the files with the original name, switch to turn off and restore to original images in one click. Multiple settings for resizing, add watermark and more to get the best result. Fast conversion speed to enjoy a conversion with the program.